Pompey will miss out on the prospect of coming up against a Blues old boy at Rochdale on Saturday. But the Fratton faithful could be forgiven for this one-time Pompey player escaping their memory. After all, he played only 45 minutes for the Blues – in a pre-season friendly at the Hawks in 2015. A run-out of little significance that has since unsurprisingly fallen below the radar. 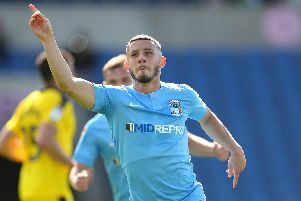 Yet, Connor Randall – who is currently out with a fractured cheekbone – arrived on the south coast as a young player with a growing reputation, after captaining Liverpool’s under-18 side. And after then-Pompey boss Paul Cook turned down the chance of signing the right-back in favour of Ben Davies, he was utilised by the Reds on three occasions that 2015-16 season. Significantly, he was part of the Liverpool side who thrashed Southampton 6-1 in the League Cup that campaign, while Randall made his Premier League debut against Bournemouth in April 2016. Since then Randall has found his way to Spotland via spells on loan at Shrewsbury and Hearts. But his bid to make an impression at Rochdale and a reunion with Kenny Jackett's side has been thwarted by the cheekbone injury he suffered in the Checkatrade Trophy victory over Bury this month. That means he’ll sit out the Blues’ trip to Greater Manchester on Saturday, perhaps offering him the chance to reacquaint himself with some of his former Pompey team-mates. But with only Christian Burgess, Brandon Haunstrup, Gareth Evans and Ben Close the only Blues survivors of that run-out against the Hawks, his options may be limited. Meanwhile, the Pompey quartet may need a gentle reminder of their brief encounter back in the summer of 2015.